Effective time management and skillful project handling are essential to businesses from all venues, especially cleaning companies. How you distribute and employ your internal resources makes all the difference in your results at the end of the year. Further, cleaning crews have to travel from client site to client site, so making the best use of commute and work time is important. If you’re looking for new methods to boost the productivity and profitability of your commercial or residential janitorial services business, you’ve probably stumbled upon many software options that can help. New technologies offer effective ways for cleaning companies to streamline internal processes so that your work gets easier and better. Innovative solutions such as time and project management software can be of great benefit in managing your cleaning company. They can provide you with useful tools such as GPS time tracking on mobile devices, easy-to-use scheduling and attendance apps, and even seamless invoicing and payroll. All these functions ultimately aim to save you time, optimize the logged hours of your employees, and help you focus on growing your business. Here are just some of the options that can contribute to better efficiency and improved results. One of the most practical functions of Hubstaff's time management software for janitorial services is the revolutionized time tracking. Instead of using manual time cards and then filling in tedious time sheets, your cleaning staff can track their on-the-job hours seamlessly through the mobile app. This allows the tracking of work hours whenever and wherever needed. Employees just have to download the Android or iOS app on their mobile device, and then start the app timer with a single click. Time can be tracked to the various projects and tasks you have set within your Hubstaff dashboard. Automatic timesheets are then sent to you, so you can review and approve them with a click. This can be a huge timesaver if you’re used to tracking people down to report their hours. In addition, Hubstaff also offers GPS location-based time tracking. This allows you to spot which clients require extra attention, and also be aware of where your cleaning crew is throughout the day. The GPS data also informs you how much time is spent on driving between locations, which you can later take into account for better planning. Hubstaff will also send you automatic daily time cards. This allows you to review the progress on your projects, as well as the time spent by each employee and at each client site. You’re better able to estimate how time-consuming certain jobs are, and thus adjust your planning and scheduling accordingly. Coordinating the scheduling of your cleaning team can turn into a nightmare if you’re not equipped with the right tools. It can also be highly ineffective if not backed up with direct information from the daily routine of your employees. With the help of project management software, however, you can take care of shift scheduling without the hassle. By obtaining valuable data from the automatic timesheets and time tracking reports straight in your Hubstaff app, you’ll be able to make better judgments about the time needed to execute certain tasks, the best employees to do the job, and the right sequence of assignments for the week. Improved estimates and job costing all from one app. On the basis of these facts, you can then easily set the number of shifts needed for each client, and match them with the most appropriate people from your team. All of this can be done online, rather than using tons of paper and wasting time. With the help of the app, you can track attendance, plus easily set hours limits for employees. Smart notifications can then inform you and your team about missed or late shifts. Never go over budget again with limits based on each project and employee. Last but not least, you can review all available information about shifts, tracked time and limits, and then improve your planning for the following period. 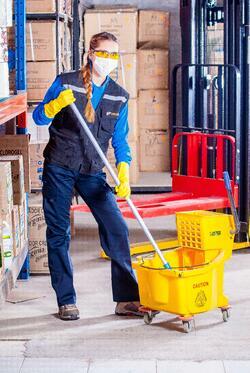 Among the most tedious tasks, you need to handle when managing a cleaning team is invoicing and payroll. They can easily eat up hours of your day. That’s why using the invoicing options of Hubstaff can be so helpful. Using automatic timesheets from your employees and the hourly rates you have set for each team member and project, you can generate automatic invoices for your clients. They are thorough, with details such as quantity, unit price, tax, invoice number, and due date. In addition, you can customize them to match your company’s branding. Then, you can forward the invoices to your respective clients in HTML, PDF or straight from the app via email. You can review the status of each invoice so that you keep track of whether you’ve been paid. As for your payroll needs, the platform integrates with the most popular online payment systems, including PayPal, TransferWise, Payoneer, and Bitwage. This means you can handle payments to your team members by simply wiring the money against the data you already have from timesheets and pay rates. The process can be either manual or automated based on the hourly rates per employee and their respective logged hours. Once you’re done with payments, you also get reports with detailed information about payroll, hours, clients, and more. With features such as easy time tracking, optimized scheduling, and seamless invoicing, you’ll be better equipped to handle the diverse and demanding tasks of managing a cleaning business. Time and project management software can be of invaluable help in improving your cleaning team’s efficiency. In the same time, the learning curve is not steep so you can get started with ease. What’s the best feature in a time management app that you’re looking for your janitorial services company?